Horse drawn ammunition cart, 1916. Rescue of a puppy during the Blitz, 1940. 'Peace scenes in London wounded soldiers with flags', 1919. Bomb damage outside the Bank of England, London, 7 January 1942. 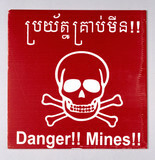 Minefield warning sign, Cambodia, 1997-2002. Bombs and searchlights lighting the night sky, London, 1 September 1940. Air raid shelter, Holborn Station, World War Two, 30 January 1940. Soldiers of the 17th Service Battalion, 29 July 1916. 'Gas mask drill for evacuees', 27 February 1941. 'Reserve troops waiting to move up to the forward area', France, WWI, 1916.